Sangha is a Network, not a Club – Engage! editor: I’ve discovered a new movement in Christianity which models “church” as an open ‘centered set’, as opposed to a closed ‘bounded set’ (see discussion below). I’ve come to see ‘sangha’ as a network of people who share my perspectives on spirituality, reality and ethics, including people who aren’t Buddhists. The network is both face-to-face and online. It is ecumenical in that it includes different Buddhist traditions and organization, though for me it’s primarily Indian/South Asian Theravada, and Tibetan teachings. The network also includes a lot of people who aren’t Buddhist, but whose perspectives are enlightening and inspiring. It is a ‘centered set’ such that in the centre are people who share views that are closest to mine, and people that I practice with on a regular basis. The rest is an open and unbounded space of people and organizations that I come into contact with that I learn from, although they may have very different views and practices. It takes a lot of effort and time to build this network, a lot of outreach to people in many different Buddhist organizations, much dialogue and relationship building. It tends to go against the model of sangha as “church”, especially a ‘bounded set’ church. Worse, many Buddhist sanghas feel like an exclusive private club of people who are “just like us”, usually rich, white and upper class. It’s the corporate model of Buddhism. Connecting to sangha as a network tends to preclude financing big real estate projects and program endowments, which is the defining feature of the corporate model. Once again, the network model beats the corporate model because it’s cheap, flexible, global, and runs on networked information, not finance and real estate. Singhashri: this was a brilliant talk on inclusivity and belonging. But it raised the question for me, “how much belonging is enough?” [personal stuff…] So maybe that’s enough belonging? I have gotten into trouble before with ‘over-investing’ in sanghas, because I made friends with a few people and thought I was “home”, but then backed out because the organization turned out to be a really poor fit as a whole. ‘Over-belonging’ has been a problem for me, where I feel suffocated and repressed. I prefer to feel the freedom of some distance from the group, where I’m free to explore other traditions and relationships on my own. Also, I have connections to other sanghas: a group that sits once a week at a local Sri Lanka temple; a monthly sit with a queer dharma group; friends i’ve made in other traditions. So I feel that all these groups and people are my “sangha” collectively. I’ve made the mistake in the past of thinking that I’m going to find everything I need in one group or organization, and I find that is not only not the case, but riddled with problems. My approach to ‘belonging’ is to find out how much belonging is enough with a particular group and stick with that. That leaves me free to make other connections that are important to me. Maybe I’m ‘polyamorous’ with many Buddhist sanghas? Poly-Buddhist? is that a thing? One concept that really helps grasp the concept of living and ministering without doctrinal statements is idea of bounded and centered sets. This ideas was initially developed over 30 years ago by missiologist and anthropologist Paul Hebert in his book Anthropological Reflections on Missiological Issues. His ideas were then popularized by Michael Frost and Alan Hirsch in their book, Shaping of Things to Come, and in the book edited by Darrell Guder, Missional Church. 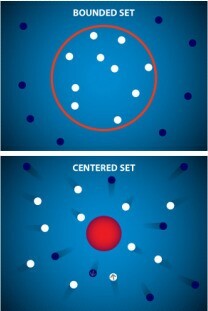 Below is a brief summary of Bounded and Centered Sets. A bounded set is where we create a boundary, a theological border, a doctrinal fence, and separate those who are inside the fence from those who are out. It is an “us” versus “them” mentality where everyone on the inside is accepted, loved, and welcomed, while those outside the fence are kept away until they can change their beliefs and behaviors to fit the entry requirements. If it helps, you can think of a bounded set as a Western style horse corral. The cowboys build the fence to keep the horses from wandering away. Outside the fence is where wild beasts and rustlers reside, just looking for a chance to kill or steal a horse. 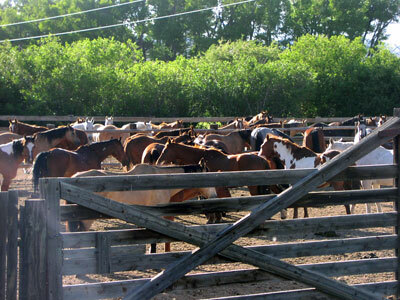 In this situation, the fence serves to protect the property of the cowboys, and also makes it easier for them to feed and care for their herd. Occasionally, a wild animal gets into the corral, where he is summarily shot. Sometimes, however, the cowboys go out and capture some mustangs from the wild, and bring them back to the corral. But before these wild horses can be introduced to the rest of the herd, they must be broken. They must learn to enjoy the safety of the fence. Usually, the wild horses are tamed, and introduced to the rest of the herd. Though they may still long for the freedom of the open range, they eventually learn that life inside the corral is pretty good. There are no predators and the food is easy to obtain. It is safe, warm, and clean, and there is plenty of time for food and friendship with other horses. One can easily see the many similarities between the image of the horse corral and what is today the most prominent model for church. Doctrinal statements and membership requirements serve as the fence. The Pastor and Elders are the cowboys, who do most of the protecting and providing so that the horses can feel safe, warm, and clean, leaving plenty of time for food and fellowship. As long as the horses have a good group of cowboys, it’s not a bad deal. The only real cost to the horses is their freedom. But how is this different than just a random mass of people randomly milling around? Because of what is at the center. 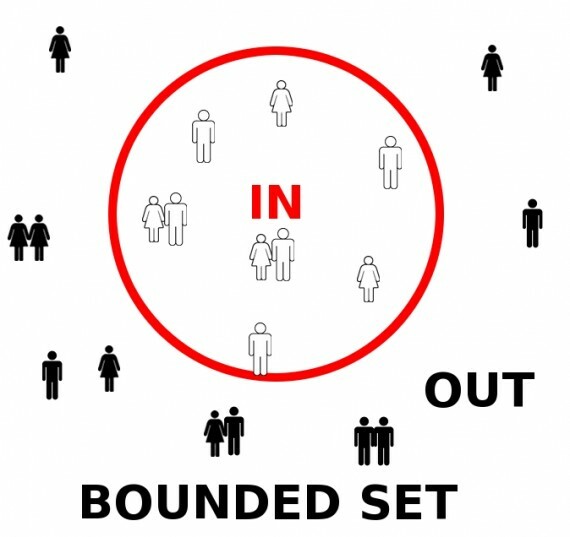 A centered set has no boundaries to keep people out, but it does have something compelling at the center which pulls people in. There are no gatekeepers turning people away, for everyone is on equal footing, being pulled toward the center. Everybody recognizes that it takes time to be drawn in, and some move faster while some move slower. Some even move backwards. In fact, lots of people do. Many get closer in to the center, and do not like what they see, and so start heading back in the opposite direction. But everybody understand this, because everybody has done it. The pull toward the center is never so strong that it cannot be resisted, and everyone has resisted and drawn away from the center at one point or another, and so they understand that people sometimes pull back. But no matter how far someone pulls back, at no point do they ever stop “belonging” for there is no outer boundary that can be crossed. If a horse corral helped picture the bounded set, a water hole in the African grasslands might be a good picture of a centered set. In many cases, there will be only one watering hole for miles and miles in any direction. This means that animals that live in the area will never stray too far from the water, especially in the dry season. During the rainy season, they may stray further from the hole, but they always know where the water can be found, just in case the rains do not come. And during the dry season, when the rains do not come and the grass withers away and the ground is parched, it is not uncommon to find hundreds of different animals all sharing the same watering hole. Animals that at any other time of year might stay away from each other, or even prey on one another, will live in relative peace and safety near the water hole. 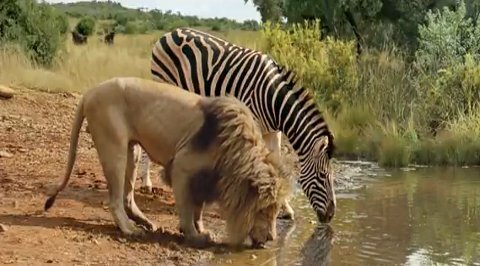 Lions, zebras, deer, and birds will drink from the same water, and while the rains are absent, will not stray too far from the water, for they know that the water is their life. There are no fences to pen them in, and no cowboys to keep the peace, and yet the draw of the water is enough to accomplish both. While centered sets are not the common way of doing church today, they are becoming more common, and will be, I believe, the predominant model of the future. People of all backgrounds and beliefs will be welcomed at the table to join in the conversation, to participate in serving the community, to learn from and challenge each other, and to encourage one another to move ever closer to Jesus Christ. In such an atmosphere, there is room for people of all faiths, all backgrounds, all races, and all creeds. What do you think of these two approaches? What are the benefits or dangers of both? Where else do you see these types of sets in nature or society? 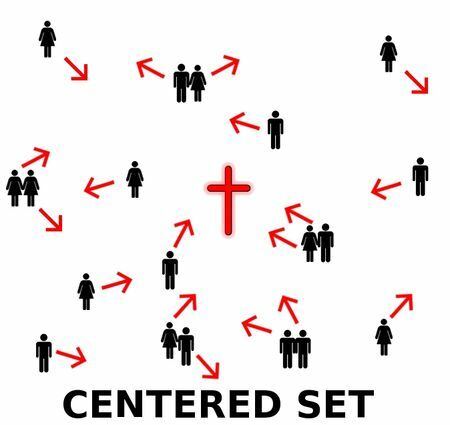 Do you think a bounded-set church can become a centered-set?